It’s a big one, literally and metaphorically. Above you may observe chocolate in one of its natural habitats (for it has many, obviously), with a cashew butter topping and chocolate shavings. 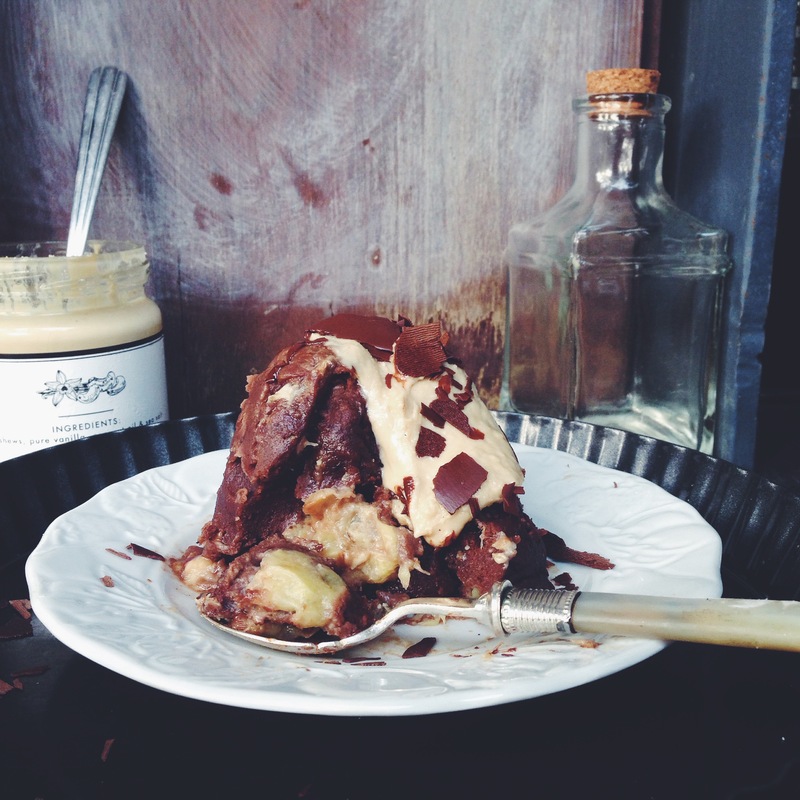 A moist, fudgy-in-the-centre mug cake, with mashed banana in the centre for optimal gooeyness. A little firmer on the surface, but easy to break into to reveal a tender, soft belly. I don’t think there’s anything much that beats a piping hot, warm, fudgy chocolate treat first thing in the morning, especially if the whole mixing and microwaving process is this easy. Maybe I should spill the beans upfront– I’ve never made a mug cake before. I always felt as if doing so is a total, embarrassing cop-out; why microwave (does that word chill you to the bone and bring to mind grease-framed images of ready-made meals or bad takeout?) when you can put to good use your lovely and probably very expensive oven? Although I appreciate and prefer a traditional fudge cake made in the oven, all 50’s aprons and 30-minute labours, this sort of recipe is perfect for one those mornings when you want to feel indulgent, but just… Don’t want to spend all that long being a princess. In a bowl (not the mug you’re making the cake in), whisk together the flour, sugar and cocoa/cacao powder. Take a tablespoon of this dry mix and toss it with the chocolate chips in a separate saucer, just so they’re coated with the flour mix. Mix in the rest of the ingredients except for the mashed banana (egg, milk and oil, then the chocolate chip and flour mix). Grease your mug and pour in half of the chocolatey mix. 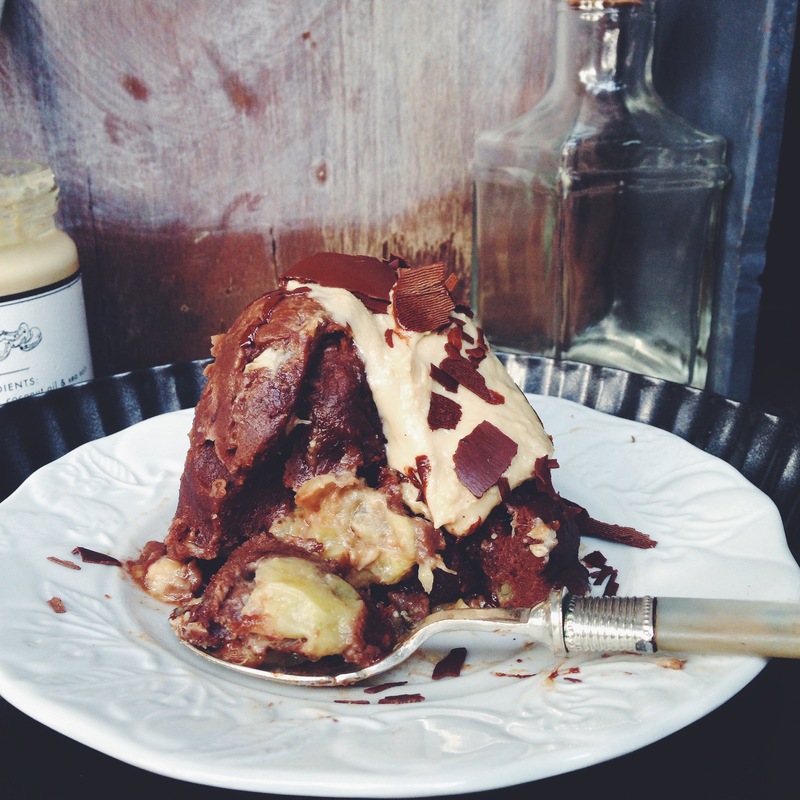 Put the mashed banana on top, then add the rest of the chocolate mix. Microwave this on high for a minute, or check the doneness with a spoon at the 45-second mark. Poke and prod to see if it’s done to your liking; take it out a little earlier if you like that little extra fudge! Keep in mind that you must watch it like a hawk because this cake does rise a little, and if you’re not careful, it might collapse or overflow, especially if your microwave is on a particularly high heat setting. Top with whipped cream, or nut butter, and enjoy with iced coffee or a glass of cold milk. Alternatively, douse the entire thing in cold milk and enjoy as a sort of bread pudding! It’s perfect for breakfast. Or have some as a small snack and keep the rest for later, for some things are never too late to microwave. Looks delicious! Definitely going to add it to my list of recipes to try!